An article in today’s Haaretz (excerpts below) unfolds bits of such scientific sleuthing as it traces recent developments in the life of the astounding Lod mosaic uncovered nearly three years ago: the IAA’s ongoing conservation efforts, travels which sections of the mosaic have made to various museums and exhibitions, and plans for its future presentation to the public in a permanent installation. 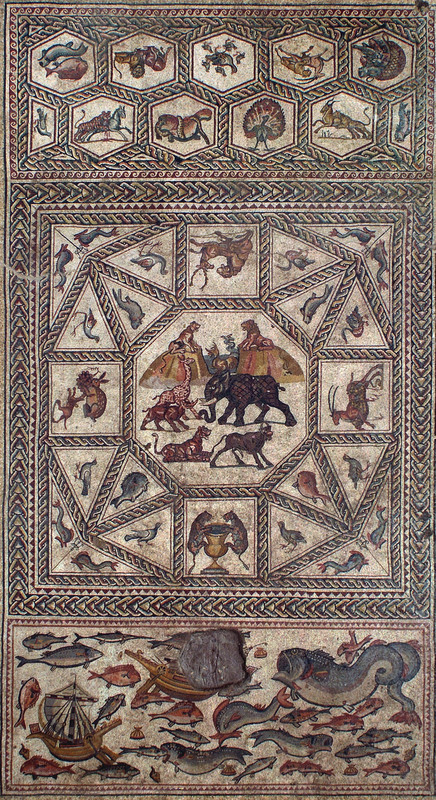 Given the sheer size of its three contiguous mosaic carpets totaling some 180 square meters, plus their intricacy and extraordinary state of preservation, this Late Roman-period masterpiece is without equal among the mosaic works so far discovered in the country. The modern city of Lod, situated on Israel’s coastal (“Sharon”) plain between Jerusalem and Jaffa-Tel Aviv, is ancient Lydda of the NT (Acts 9:32-38). It was destroyed by the Romans in 66 AD during the early stages of the Great Revolt (Josephus, War 2:515-16). Refounded by Hadrian as Diospolis, Lydda was elevated to the rank of a Roman colony under Septimius Severus in 200 AD. It remained in Roman hands until becoming a Christian city and eventually succumbing to Arab conquerors in the year 636. At the time the mosaic was first uncovered in a construction project in the 1990s, funds were unavailable for its conservation, so it was carefully covered over for protection and left for another day. That day came in 2009 with a gift from the Leon Levy Foundation and donor Shelby White, when the work was again uncovered, briefly opened to public view, and then cut into sections and taken up for conservation. 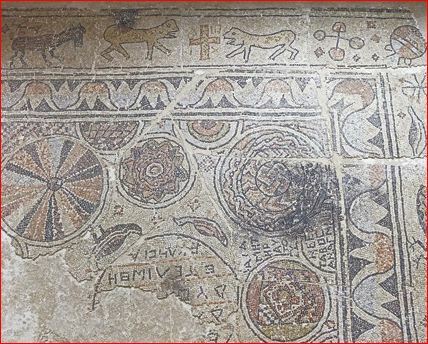 The mosaic was covered until three years ago, when the antiquities authority and the Lod municipality brought it to light, invited the public to see it – and then removed it. Parts have been sent abroad to raise funds for a future museum to house it. It has been displayed in the Metropolitan Museum in New York, San Francisco’s Legion of Honor Museum, and the Field Museum in Chicago. To conserve it and also allow it to be moved, Nagar supervised its cutting into pieces, and backing with a lightweight aluminum and fiberglass frame. Although the technology has come a long way from the heavy concrete backing once used, Nagar says: “I don’t believe in modern materials.” And so a thin layer of plaster, similar to the original, has been inserted between the mosaic and the aluminum construction. The detailed study of the mosaic has revealed a number of fascinating clues about how it was created, and by whom. Nagar believes the master artist was internationally famous and was based in North Africa (but apparently had never seen a giraffe, which is depicted with antlers! 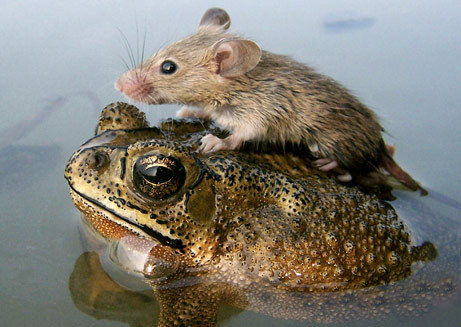 — see photo). 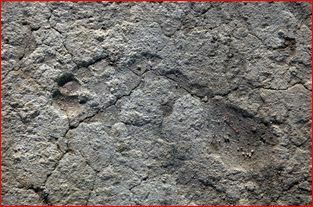 There are even some tangible traces of those who did the work: Among other things, more than one of them, including children — who I suspect found it irresistible, just like kids today — left their footprints in the wet plaster matrix, some 1800 years ago! Nagar says the work took about three and a half years, and at least three people worked on it, each with a distinctive style. Something else distinctive about the artists has emerged: One wore a size 43 shoe [USA size 9 -tp], another was shorter and wore a 36 [USA 4-1/2], and women and children also worked on it. Nagar and his staff discovered this when the original plaster backing, revealed during the mosaic’s removal, was found to contain footprints. The antiquities authority and Padua University in Italy are now studying the footprints with laser scans and examining the plaster’s make-up to learn more about the artists, such as their height and weight. “Someone worked and left this behind; now I’m working. There’s a psychological connection here,” Nagar says. The laboratory has another large mosaic, excavated about 40 years ago in the Lachish area that also features lions and other animals, and geometric patterns. 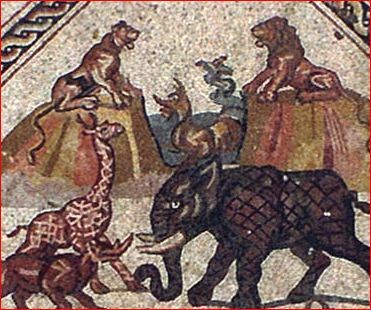 But the lion’s mane and tail are missing and the donkey has a limp, the peacock’s foot is distorted and the circles are crooked. But Jacques Nagar, the lab director, loves them all. “It’s primitive, but you’ll never make another like it … it’s beautiful,” he says. This entry was posted in Antiquities, Archaeology, Uncategorized and tagged Archaeology, conservation of antiquities, Israel, Late Roman period, Lod, Lydda, mosaics. Bookmark the permalink.